Has Microsoft shown its hand? Microsoft is planning to release new versions of its Surface RT and Surface Pro tablets within the next year, the company has seemingly confirmed. 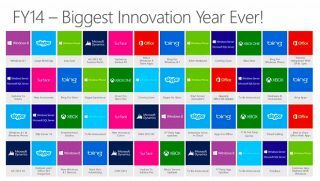 During a session at Microsoft's Worldwide Partners Conference, it displayed a slide entitled "FY2014 Biggest Innovation Year Ever!" which outlined the software giant's plans for the rest of 2013 and beyond. The slide listed "Update to Surface RT" and "Update to Surface Pro" alongside other landmarks like the release of the Xbox One, Windows 8.1 and new Windows 8.1 devices. It also promised new Surface accessories and accessory colours, which could mean new-fangled tablet covers, with recent rumours suggesting future iterations will actually be able to charge the device. In terms of new Surface devices, Microsoft has recently cleared the way for 7- and 8-inch tablets with Windows 8.1 and it's expected to give consumers a 7-inch option sooner rather than later. It's also thought that the company may have an Xbox Surface tablet, optimised for Xbox Live gaming, in the works. New devices running Windows RT are set to boast Qualcomm Snapdragon 800 processors, while Intel's new Haswell chips may be on board the Windows 8.1 devices. Other as-yet-unannounced items within the presentation slide include large meeting functionality and an update to the Windows Phone and Windows 8.1 Skype apps, along with improvements to the Xbox Music service. There's loads of speculation regarding the possibility of a Microsoft Surface 2. Why not dive in and take a gander?